Marc talks about what happened today in history, including the day the Battle of the Alamo ended, the day the Supreme Court handed down the Dred Scott V. Sanford decision, and the day artist Georgia O’Keeffe passed away. This is Marc Steiner, and today is March the 6th. That’s “Love Child” by The Supremes. Today is the birthday of the founding member of The Supremes, Mary Wilson. She was born in Greenville, Mississippi today in 1944 and grew up in Detroit. She started her career singing while she was still in high school with a group called The Primettes. That group would become The Supremes after they got a deal with Motown Records in 1961. Happy Birthday, Mary Wilson. There are moments in today’s day in history that on the surface do not seem related, but that the twisted history of race in America weaved together. In the early days of this Republic, the arguments over admitting new states into the United States were based on whether they would be slave owning or free states. On Capitol Hill, they fought to keep a balance between the two. The power of the slaveholding states was immense, and it had its Northern industrial allies who needed that cotton and raw material. The division over free or slave states intensified when the U.S. bought the vast Louisiana Purchase from France in 1802. The now state of Missouri was part of that new territory and it wanted to be admitted as a state, but would it be slave or free? What would become the Missouri Compromise was fought out in the halls of Congress. The power of slavery won out over those who opposed it on the Hill and the Missouri Compromise allowed Missouri to enter as a slave state, while Maine entered as free state. The dividing line was drawn on the Louisiana Purchase territories with everything north of Missouri prohibiting slavery. Today in 1820, President James Monroe signed the Missouri Compromise into law. When it happened, The Missouri Compromise was only second to the Constitution in importance, and was held onto as as the only thing holding the US together. But others, like Thomas Jefferson, saw in as the seeds of a civil war. And 16 years later in 1836 in New Spain, which is now the state of Texas, the Battle of the Alamo came to an end. Three thousand Mexican soldiers overran the Alamo and 167 Americans were killed. That the fact that slavery was at the heart of this story is rarely focused on. After the Louisiana Purchase, many in the slaveholding states wanted to expand their territory and went from what is now Louisiana and Arkansas into what is now Texas with their slaves to claim new territory. The problem was that this was Mexico, and 7 years earlier, Mexico abolished slavery and people of African descent were free. Those Americans in Texas wanted another slave territory. Those men died at the Alamo, but Texas would become a new slaveholding state in the next 10 years, which in part played out because of the Missouri Compromise. Twenty-one years later in 1857, the Supreme Court handed down the Dred Scott V. Sanford decision. 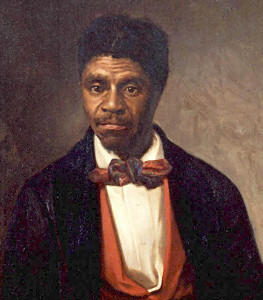 Now many know the name Dred Scott and that it is synonymous with the idea that an enslaved man was not allowed to live free. The decision clearly upheld the institution of human slavery to be legal and right. What it said was that African Americans, free or enslaved, could not be citizens and had no standing in federal court. It also held that the federal government had no power to regulate slavery in any territory after the US became a nation. So, what it did was overrule the Missouri Compromise, which is where we started this Day in History. Dred Scott and his wife Harriett were sold to an Army officer who took them to a place called Ft. Snelling in Wisconsin that was once part of the Louisiana Purchase. Part of their case was based on the Missouri Compromise. The Supreme Court in this case made the Missouri Compromise null and void, and it was the second time in US history that a law passed by Congress was found unconstitutional. So, the power of the institution of slavery threads its way openly and surreptitiously throughout American History. And just to conclude this historical weave, Dred and his wife Harriett had their freedom purchased by the son of his first owner. So, he died free and a celebrity in St. Louis, not far from Ferguson. Ghana became the first British colony in sub-saharan Africa to become an independent nation in 1957. The British called it the Gold Coast. It was a gold coast — the Akan people’s Ashanti built its power in part from the sale of gold and became a highly nuanced government. Kwame Nkrumah was elected the first President of Ghana, a leading voice in the Pan-African movement. Ghana today is a thriving democracy. Happy Birthday to Maurice Ashley, the first Black Grand Master in Chess. He is 19 years old today!!! She was 98 and passed away in her beloved New Mexico amidst the landscape that inspired her work today in 1986. I’m talking about the great artist Georgia O’Keeffe. Truly one of the greatest ever, her work stunned us because it brought us inside objects to feel them. She created images that grew out of landscapes and plants. She opened modernism to many.